Thinking about what you should have and wish you did have, simply prevents you from enjoying what you actually do have! What is the point of seeking new things if you never enjoy the things you already have? 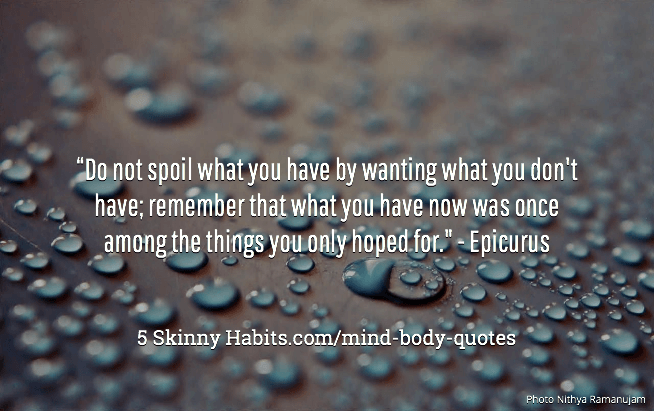 Epicurus adds, “remember that what you now have was once among the things you only hoped for” i.e. the things you assume will make you happy when you attain them are no different than things you have now, which you hoped for. Desire is never satiated if you don’t live in the present and enjoy what you have now. Appreciate what you have because you also wished for it before you attained it.